This week I face the greater challenge of using my tablet to post. My MacBook is in the shop awaiting diagnosis of a display issue. That is taking longer than I expected. I have a couple of photos with nice smiles that meet the challenge, both have been used before but that means they are at least accessible. And they both make me smile too! Good because I am need of cheering up right now. I saw the exhibition that is referred to in the original challenge, at least I saw it being set up at the VAG, but the staff were most insistent that I could not take pictures of it. And what I did see did not tempt me to return. I have been advocating a metropolitan police force for Greater Vancouver on this blog for some time. This most recent thought has been spurred not so much by the recent spate of gang killings as the provincial government’s hastily thought out “strategy” for dealing with it. But here’s the question that no one seemed to address at the Premier’s news conference on Friday: Who’s in charge of eradicating gang violence in Metro Vancouver? It’s a question put to me by a Metro Vancouver police chief last week. I didn’t know the answer. You can’t have a successful strategy for anything without someone in charge. And in this case, there’s no one responsible because of the patchwork nature of policing in Metro Vancouver. My point would be that it is not just for dealing with gangs that we need a co-ordinated policing system. It is every aspect of policing. The only people who advocate for the present system are the mayors who like the idea of having a police chief report to them and not some remote regional authority. But we can no longer afford this small town mentality. Anymore than we can afford the arrogance and incompetence that has characterised the RCMP in recent years, and is now on daily display. If the Premier had actually been giving this issue any thought at all in the last couple of years – and there have been plenty of reasons why he should have – he would have seen that the need for change is inescapable. A provincial force for BC and metropolitan police forces for the Vancouver and Capital regions would be my first choice. Mission accomplished – I have completed the Myra Canyon trestles, something that I have wanted to do for a long time. I was last up here five years ago when the whole province seemed to be in flames, and many roads were closed by thick choking smoke. The trestles burned soon afterwards and have only re-opened relatively recently. The drive up to the canyon is an ear popper – and the last 8.5 km are on a steep and twisty forest service road. The Yaris breezed up it easily. There is a large car park at the top and a gate to prevent vehicle access. Then 12 kilometres of the former track bed (mostly) which has been laid with a good loose surface. Before leaving home I had switched out the wheels so I now had off road tires. There are a few spots on the trail where there have been washouts and slides, and surface is not so great, so a good choice on the whole. I was not trying to break any speed records but getting there in the morning before the crowds arrived was also a good idea. While the forecast high in Kelowna was 28 today, up there it was distinctly cooler and everybody else seemed much better wrapped up than me. But once I got going I did not feel cold – except in the short tunnels and longer shady section. The ride is a major attraction and at the height of the summer 500 visitors a day is not uncommon. I was pleased to meet some of the volunteers who made this possible and swapped yarns with people who had ridden the route before the trestles had decks and railings added. I stopped frequently as the opportunities for pictures are endless. I failed to get any shots of the little ground squirrels or the mule deer which flashed across my path. It is incredibly quiet, at least until around noon when the numbers of visitors started to grow rapidly. My bike lacks a bell so I found my ability to imitate a steam train whistle quite useful. I also had lights for the tunnels but forgot that the front bracket (a nasty cheap plastic thing) had snapped off some time ago. Not that lights are needed. By midafternoon I realised that one granola bar and a bottle of water was not enough. There is nothing near the canyon – and only earth closets when you get there. Not even a drinking fountain. The first sign of refreshment on the way down a was at a golf club who produced a very satisfying burger and fries and a pint of stout which filled the bill nicely. It is also extremely dusty up there and I was glad of a swim when I got back. The motel also had complimentary fresh local fruit – huge peaches obviously straight off the tree which made me feel like I needed another bath by the time I had finished. I will confess that for a long time I have disliked the idea of “rails to trails”. I would much prefer the rails to be put back – something that enthusiasts have achieved extensively in Britain. I always thought that trains would make a comeback as oil prices started to rise – as they have. 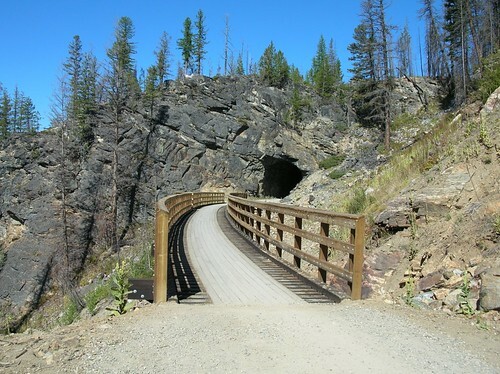 But I suppose it is highly unlikely that much more of the KVR will reopen – beyond the short stretch in Peachland. The 12 km ride each way is easy because the grades are only around 1% – and anyway no one is in a hurry. I recommend that if you have not been here you should make the effort and get here. Bring a picnic and plan to spend the day. My favourite restaurant here was kitty corner to this one but is closed. Note to travellers – even if there is no sign saying “free wifi” it doesn’t hurt to ask. Especially when they do not have an open connection and you need a password to log in. And just becuase there is a line up does not means it is necessarily especially good. In this case it means that there are two bus loads of English lawn bowlers ahead of you. But the Blue Moose is OK even if the bowlers seem to have cleared much of the pre-prepared food. 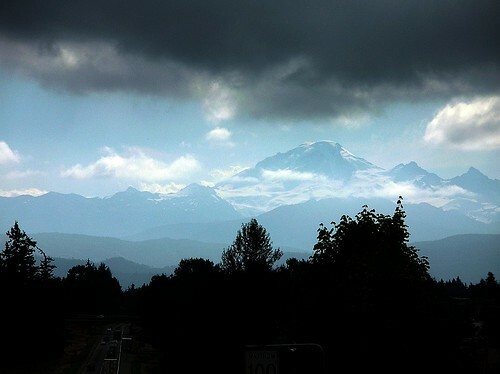 The skies were overcast with a steady drizzle all the way to Abbotsford, when a thin stream of sun burst through and I got a shot of Mount Baker. 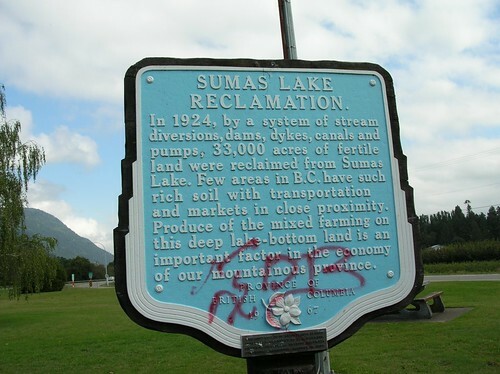 My first stop was near Chilliwack where I learned about the drained lake which explains why the interurban route is not as direct as it could be. When it was built it had to go around – not straight across as the freeway does. The high cost of internet access from my hotel – and a lack of desire to lug the laptop around with me looking for free wifi – means there will be little news from me for a day or so. i am still moderating comments – but posting more than this will have to wait for a bit. This post is going to be about operating systems and open source software. It has nothing whatever to do with the declared intention of this blog but I make no apology. This morning I came across a new (to me) WordPress blog that I immediately added to my bookmarks and the blogroll. One of the best sources of views in recent days has been the WordPress.com home page. I don’t not know how I come to be there – and I do not see myself there when I go to it. So I suppose there must be some clever code that decides what to show me that I do not already know about – like my own blog. So I look around and find Linux Owns. It has a number of things useful to Ubuntu and other Linux distro users. But what I want you to look at is Why the normal pc user should try ubuntu. It does much better than I could what I think needs to be done. If you are still captive to Microsoft, you need to break free. And Ubuntu is the way to do it. (I did try Knoppix but I cannot recommend that in good conscience as it drove me nuts: it may have got better since, but Ubuntu is now much more popular). You do not have to give up Windows. This machine I am typing on now still has XP – because the hardest thing for me to do is to forget old software, not learn new ones. And there are some things that I know how to do that are easy and work, and are frankly not worth climbing the learning curve again for. But you should know if you use Open Source software (like Open Office) you can still easily use files that need to be used by others on Windows systems. Linux is free. Ubuntu can be run from a CD. You do not have to give up anything. You can try it risk free. At around 11 am a calvacade passed along Russ Baker Way, and all traffic was stopped to let it pass. It was headed northbound. It appeared that the entire Vancouver Police motorcycle squad were invloved and a lot of Vancouver police cars too. The local mounties did not know much. One was behind me on the Dinsmore Bridge and made a U turn rather than get delayed by it. The vehicles included unmarked SUVs with black windows and a stretch limo.